ÖBB-Infrastruktur AG, the Austrian national rail infrastructure company, will put 381 million euros into Styria’s infrastructure development. Furthermore, the overall investment for the period 2018–2023 is 2.8 billion euros. With these funds OEBB is on the right track for a modern, environmentally friendly railway future for the Austrian state. Styria is home to around 1.2 million people. Many passengers, commuters and businesses take advantage of the many benefits rail travel has over road. Shorter travel times, improved services, greater punctuality and greater safety are just some of the pros OEBB will develop with its investments in 2019. A total of 750 kilometres of track, 123 stations and stops and around 7,100 car and 5,200 bike parking spots currently exist in Styria. OEBB’s investments will shape mobility behaviour. They are also the company’s way of taking responsibility for future generations. 2019 will see much work taking place on the new Süstrecke, a 470km rail link running north to south through Austria. After engineers made the initial breakthrough in the Koralm Tunnel, the construction of the inner shell on the Styrian side is in full swing. 2019 is the first year the Koralm Railway is 100 percent under construction. After its completion passengers will be able to travel from Graz to Klagenfurt in just 45 minutes. The Semmering Base Tunnel: in 2019 works will begin on the western end and the Mürzzuschlag station. After its completion passengers will be able to travel between Vienna and Graz in under two hours. The route between Bruck and Graz will also be made more attractive. OEBB will complete the refurbishment works at Frohnleiten station in 2019, after which it will become operational. Furthermore, a new, modern training site will open in Knittelfeld in 2019 for around 200 OEBB apprentices. OEBB will continue working on its stations in 2019 too: while the major stations have already been modernised, the refurbishment works at Kapfenberg and Fehring stations got under way in 2018. Both will be fully barrier-free when completed. Tauplitz station will also get a facelift as part of the upgrade works to the Salzkammergut railway line. Combining rail travel with either vehicle or bicycle modes is more popular than ever. For that reason OEBB is investing into the further development of park & ride and bike & ride facilities. Styria will get around 190 new P&R spots and 200 B&R spots in 2019. OEBB checks its tracks regularly. If necessary, it will perform a complete overhaul. During maintenance works OEBB is at pains to avoid travel restrictions. For that reason, the company says, it bundles its maintenance measures, closing entire sections. This results in less overall downtime for passengers. OEBB invests regularly in the safety of its level crossings in order to reduce serious accidents even further. In addition to adapting infrastructure, OEBB uses awareness raising measures (co-operations, campaigns, etc.) to teach people how to behave correctly at level crossings. In 2019 Styria will get several electric charging points. OEBB is currently planning 50 electric charging stations with 100 charing points. OEBB is an important player in the efforts to bring down greenhouse gases. Rail passengers only create 1/15th of the emissions they would create by car. Things look even better for freight: ever ton that is transported by rail instead of by road is responsible for 33x fewer carbon emissions. In the summer of 2018 OEBB switched to 100 percent green electricity. The Weststrecke between Vienna and Salzburg, the Vienna S-Bahn and the route to Vienna Airport have all had their upgrades. In 2019 OEBB will work on the Südstrecke towards Kärnten and on the Weststrecke towards Tyrol. The goal is to be finished by the end of the year. 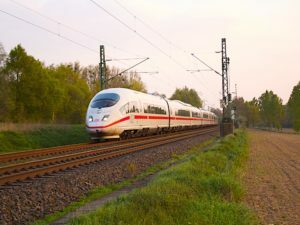 At this point OEBB and mobile phone operators will have invested 100 million euros in fitting 1,500km of railway lines with mobile reception. As a result, 95 percent of OEBB passengers will have access to mobile phone reception. The works to bring high-performance WiFi to Austria’s 75 largest stations will finish in the coming weeks. Graz Central Station, Bruck an der Our, Leibnitz, Leoben and Graz Don Bosco are Styrian stations that all already have high-performance WiFi.